North Korea Tests Sub-Launched Ballistic Missile Capability. Now What? Kim Jung Un didn’t make the trip to Moscow as originally planned for Russia’s massive Victory Day parade, but he certainly enjoyed a victory of his own — overseeing North Korea’s first test of a Submarine Launched Ballistic Missile (SLBM). We have reported in the past that the ‘Hermit Kingdom’ was actively developing a SLBM and a submarine to launch it, but the test still came as a relative surprise. The photos that have been distributed from the test launch appear authentic, at least, and they are telling. North Korea’s official name for its new SLBM (seen in the giant red writing on its side) is Bukgeungsong,” meaning “North Star,” as in “Polaris.” This is an interesting choice, seeing that America’s Polaris SLBM was a famous icon of the Cold War. The missile actually looks very much like the Soviet-era SS-N-6 “Serb” (R-27 in Russia) liquid-fueled SLBM that served aboard Russia’s Yankee Class submarines from the early 1970s to the early 1990s. Interestingly , the R-27 is supposedly the basis for which North Korea developed the BM25 Musudan, otherwise known as the Taepodong X, which has drawn the eye of military analysts during North Korea military parades since 2010. The thing is, there has never been a report that North Korea has ever actually tested the BM25 missile, and that is for a simpler land-based version. Now, they seemed to have successfully tested a submarine-launched version, or at least the launch phase of a submarine launched version. If the BM25 Musudan is closely related to the submarine-launched missile shown in the recently released pictures, which it almost certainly is as the BM25 land-based, teletransporter-erector launched version was based on the Soviet sub-launched R-27 missile in the first place, then it would also lend more credibility to North Korea’s land based arsenal. The R-27 was also very reliable in Soviet service, with a test fire success rates in excess of 90%. This new missile also has a new submarine to launch it. This sub, dubbed the Simpo Class by analysts after the Simpo Shipyards where it is being built, is rumored to be based loosely on the Soviet Golf Class of the Cold War, with updated elements ported over from Yugoslavian submarine designs. Although the submarine is relatively small, there appears to be one or two vertical missile tubes integrated into the submarine’s sail. The first time this new boat was publicly seen in a non-satellite captured photo is in a crop of the photo of Kim Jong Un smiling at the top of this post, reproduced to the left. Interestingly, one Russian Golf Class boat was actually lengthened and modified for advanced SLBM tests in the 1970s. What missile was used in these tests? A version of the SS-N-6 Serb/R-27. Also, a modified Golf Class was used to test China’s first SLBM which was also very similar to the R-27, known as the JL-1. This means that there are multiple precedents for a R-27 derivative SLBM capable Golf Class submarine and their design information could have been obtained by North Korea to create a low-cost, relatively low-tech submersible ballistic missile platform, one that packs a lot of punch for its small size and relatively low-level of complexity. It was late last year that North Korean watchdog group 38thNorth.org spotted what it believed to be a vertical launch system test stand for an intermediate range submarine launched ballistic missile, such as the R-27. This system, located near where North Korea’s new submarine is moored, was thought to be built in conjunction with this new class of submarine, lending evidence to the possibility that the boat was indeed built to launch such a weapon. There is no doubt that North Korea’s test launch of a SLBM is a potential game-changer, but just because the missile shown in the photos appeared to safely clear the water and climbed out through low-altitude doesn’t mean that the missile is fully capable of traveling thousands of miles to a specific target. In other words, a basic low-level launch test of an SLBM is a whole different animal than proving its capability to reliably climb, separate, re-enter, and detonate within even a few miles of its planned destination. Also, as we have mentioned many times before, a delivery system is useless without a warhead miniaturized and proven reliable enough to set atop of it, although North Korea is reported to have made some strides in this aspect as of late. Still, North Korea’s ability to manufacture such a precise instrument that can survive long periods installed atop a missile, housed in submarine, and then endure the rigors of a launching and atmospheric reentry remains questionable at best. Even with these hurdles, North Korea’s SLBM play makes a lot of sense. First off, stopping a North Korean ballistic missile launch before it happens is a lot more complicated when that launch can happen from a subsurface craft. As such, you can’t just blow the missile up while it is sitting on a launchpad or transporter-erector-launch vehicle. It also greatly increases North Korea’s ballistic missile range, as any sub-launched weapon’s range is augmented by its launch platform’s ability to forward deploy, possibly thousands of miles from its home port. Then there is keeping tabs on such a deadly and elusive capability. America’s nuclear submarine force is already stretched to its max, and the problem is only going to get much worse, not better, in the not so distant future. If North Korea were to field a nuclear deterrent aboard even relatively basic diesel submarines, they would become one more in a long list of potential enemy submarines for the US Navy’s limited number of nuclear fast attack submarines to track. 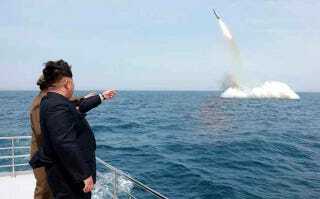 If North Korea’s SLBM capable submarines patrol to the south, tracking and a successful interception by ground-based US ballistic missile defense interceptors based in Alaska and California could be problematic. Additionally, such a capability puts outposts like Guam and Hawaii at greater risk than ever before, and well within North Korea’s nuclear reach. For a country that is rumored to already have at least a dozen, and possibly upwards of 100 nuclear warheads, SLBM capability is a scary prospect indeed, and countering even a rudimentary capability is not as easy or inexpensive as some would believe. Now we will have to wait and see if North Korea tests a R-27 based BM-25 Musudan missile, or a variation of it launched from land or a submarine. If such a missile test is a success then we will know for sure the threat posed by these yet to be seen in action missiles is real. At the same time, we will have to watch for further developments when it comes to North Korean submarine production. Will there be more Simpo Class submarines, or even something more elaborate, appearing at North Korean naval bases in the not so distant future? One SLBM capable submarine is one thing, a half dozen more is another and numbers will be need in order for North Korea to obtain a credible deterrent capability. This will also make it very tough for US submarines to keep tabs on their entire fleet at any given time. If a Musudan-type missile’s flight test were a success and North Korea puts a SLBM capable submarine class into production, they would be well on their way to achieving a basic, yet still relevant submarine-based nuclear deterrent. Such a capability will shift the balance of power in the region and could be just one more reason for other powers to explore procuring their own nuclear deterrents and advanced missile defense systems. As for the US, a North Korea with SLBM capability will mean large amounts of resources will have to go into meticulously tracking these boats, and even then there is no grantee of preventing a launch. As a result, more of America’s interests in the Pacific and on the US Mainland will be put at risk of a North Korean nuclear strike, something our current and very expensive defenses are not exactly tailored to defeat.